Genie has always prided itself on providing first-rate aftermarket support for the Genie equipment in the Top End, and this year it just got better! Darwin Access Services, the first service specialist in the Northern Territory, wholly dedicated to access equipment delivers on the ground Genie servicing. Darwin Access Services is owned and operated by Joab Coyne. According to Joab Coyne, the strength of the Genie brand in the Top End can be attributed to the industry leading service support provided by Genie. Joab began in the access industry with Top End Access. After seven years, he established Darwin Access Services with the sole objective of providing first rate service support right across the Top End. This involves regular trips to Alice Springs, a 3000 km round trip by road. As a local, born and bred in Darwin, Joab is convinced that Top End people like to support local business. Having built a strong presence in the Top End market over so many years, Genie is proud to have formed a strong service association with Joab. Together, we are dedicated to the support of Genie customers right across the Northern Territory. 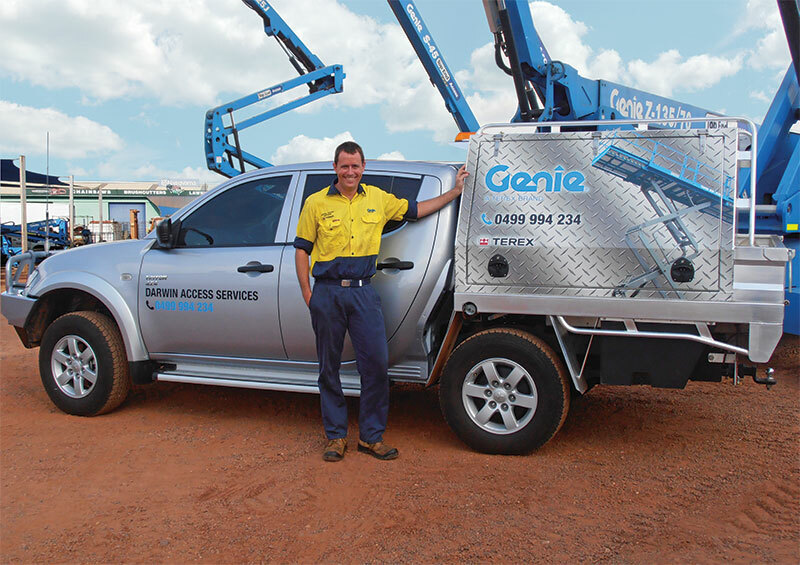 In the Top End, Genie is certainly the dominant brand of access equipment. Genie has enjoyed strong customer relationships and sustained growth in the Darwin market and with the region currently set to experience another boom period, Genie continues to invest in customer support for the region. Genie recognizes that a critical element of aftermarket support is readily available parts. To reduce machinery down time and keep your fleet operational for longer, Genie has invested in holding a wide range of Genie Parts in Darwin. Now instead of down time waiting for parts to arrive from the southern states on either overnight air freight for smaller parts, or road freight which typically takes a week for larger parts, an extensive inventory of Genie Parts will be on hand in Darwin. This will help ensure that Genie equipment is kept out on hire and operating at a productive level.